This is no time for People's Vote. I even think the EU elections should be postponed. The West, including the EU, has been underestimating an existential crisis. Putin has been waging a clever subtle war. We don't want to see it. MPs must wake up and smell the corruption. It is within your gift to vote to #RevokeArticle50 and you must do it. There's a lot to put right, democracy to be protected. Why does anyone suppose that democracy is just counting ballots, or war is just battles with guns and bombs? But she is not delivering what they meant when they voted to Leave. It's like we order prawn chow mein and they deliver pork spare ribs. If May wanted to find out what the people meant by Brexit, she had to ask them, near the time of the referendum, when it was fresh in their minds. ComRes did that. 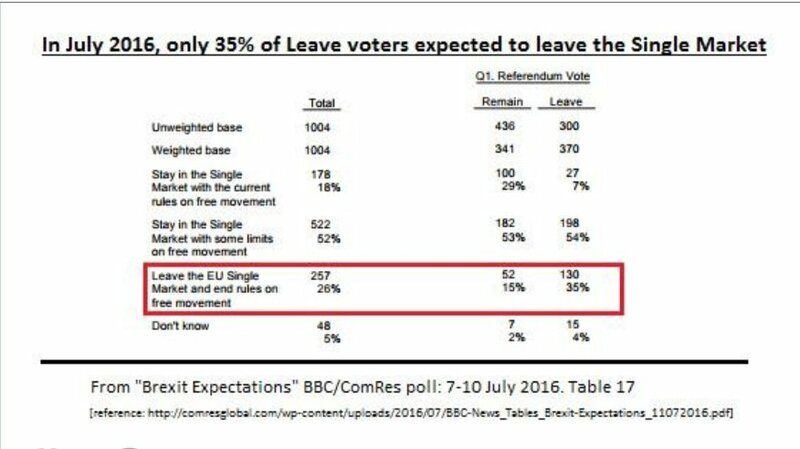 Only 35% of Leavers thought they were voting to leave the Single Market. THREAD: I don't agree @Femi_Sorry. Pandora's Box may have been opened anyway, infecting GB with populism, but it's past time we tell the truth. It was PM's & Parliament's job to stop Brexit. After advisory ref, PM weighs result together w all relevant factors to decide policy. Then policy is put to Parliament to scrutinize & legislate if nec. May cheated, claimed ref was the decision. Normally it would be natural for a ref result to be accepted, because normally a ref asks about a change for the good. If the ppl reject the change, it's status quo ante. This is the process in Parliament, time & time again. Reaching a decision as monumental as Brexit would involve impact assessments, consultation with industry, NHS, all sectors affected. These factors would be weighed alongside ref result. It shouldn't be hard to understand. Process following the advisory ref is alluded to in briefing paper 07212. Mercer QC understood it directly I raised the issue at the conference. The Exec decision is based on considering the result together with all other relevant factors. They have latitude on weight accorded. But not infinite latitude to weight ref 100% unless there are no other relevant factors. But there is: the interests of UK. Normally a proposed constitutional change would be in the interests of the nation. Otherwise why put it to a referendum? Why ask the ppl for their approval? The decision process required by #A50 is simply that which separates democracy from dictatorship. Executive decides on policy within its party political perception of national interest, based on evidence, impact analysis, etc. parliament scrutinizes, then legislates if required. Then to deceive the electorate, telling them it is their decision - a mandate - when the law says it is not their decision, but advisory. It was Govt's duty to assess the result together with relevant factors & Parliament's duty to debate Govt's policy, not to rubber stamp it. You replied to Alex Salmond that the referendum was advisory, so nothing followed from it, and therefore a safeguard, such as Amendment 16 which he wanted, made no sense. As if just leaving the seats in the European Parliament is what *leave the EU* meant in the referendum, The debate (if it can be dignified as a debate) was not about a building. It was about the rights & obligations, the costs & benefits, of EU membership.